Background: Mamadou Diallo is known as “Big Mama”. Like the Martin Lawrence movie of the same name, he is unbearable to watch. He’s a huge, sulking Senagalese striker. 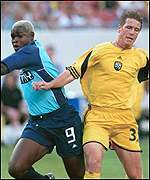 He currently plays in Mali, but back in 2000-2002, he played for three MLS teams: the New England Revolution, the New York Metrostars, and the Tampa Bay Mutiny. Career: Diallo has played in almost one dozen nations. Why does he move around so much? Well, he is known for his fiery temper and dislike for authority (especially his coaches). He’s a regular for the Senegal National Team, and he is definitely a prolific scorer, but his temper tantrums have always cost him. His most famous incident occurred in MLS. Dishonors: Diallo’s place on this list is due to many small displays of bad sportsmanship and one big one. On August 16, 2000, Diallo and the Mutiny faced the Metrostars. After colliding with goalie Mike Ammann, Diallo stood up and stepped on Ammann’s ribs, puncturing his lung and ending his career. It is remembered as MLS’s dirtiest play ever. Legacy: Diallo’s legacy depends on who you talk to. Those who believe Diallo “accidentally” stepped on Ammann support the striker, but those like me who have seen footage of the play still feel that Diallo intended to injure Ammann, even if he didn’t mean to end his career. Diallo’s incendiary talent will always ensure some fans love him. But, fans of fair play – and Mike Ammann – will never care much for Big Mama.